First timer and not sure what a virtual book club is? Check out this post first for tips on how to host a book club (for just you and your kids or for a whole group) to instil a love of reading in little kids. Our selection for the Itsy Bitsy Nimbus Book Club this month is for kids of all ages and will be the perfect companion to your summer adventures. 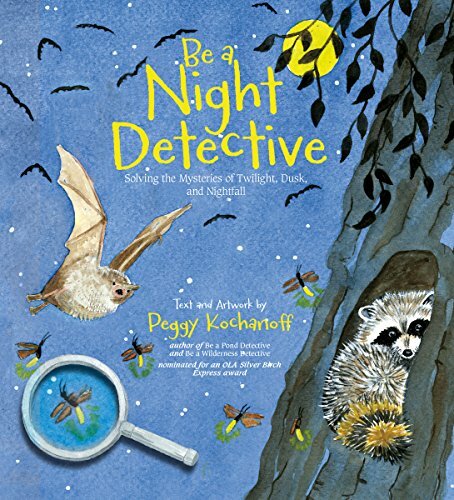 Be A Night Detective: Solving the Mysteries of Twilight, Dusk, and Nightfall by Peggy Kochanoff is the latest in a series of books she's written (Be a Pond Detective, Be a Beach Detective, and Be a Wilderness Detective) that encourages children to explore the natural world around them. This book is non-fiction and answers all those questions that kids ask us which, let's be honest, we adults really don't know the answers to (why don't lightning bugs get hot like light bulbs? Are shooting stars really stars falling from the sky?). It explains it in child-friendly language and with great images to illustrate the reasoning. This is a book we will be taking with us on camping trips or evening walks as a reference this summer for sure! To explore the book further we created a night time Scavenger Hunt and constellation scratch art that we're sharing with you today. After looking through the book Mr. M (age 3 3/4, and, no, I'm not quite ready to say "almost four" yet) and I picked out some of the night time critters that we thought we'd have the most luck encountering and created a printable Scavenger Hunt of nocturnal critters, sights and plants. Going on a nighttime adventure (even if it's only early evening) is a pretty big thrill for little kids. Read through the book with them first and explain why these things usually only come out at night. Then grab some detective gear (binoculars, magnifying glass, maybe a container to temporarily place interesting bugs or leaves during the walk), spray on some bug juice, and head into the woods with your book and scavenger hunt. Ask the children to be very still and look and listen to the things around them to see if they might be able to see or hear anything from the list. Whenever a sound is heard or a sight is seen, try to identify it using the book and check it off the list if it's one of the ones on it. Encourage them to get up close and personal with nature. Examine those leaves and flowers, follow the sounds they hear, lay down and stare at the night sky and watch for a shooting star or try to identify a constellation. This activity is a great exercise in slowing down and carefully seeing and listening to the natural world. Little kids are often so wrapped up in themselves that they have trouble staying still and focusing. Giving them this scavenger hunt provides a purpose and a fun way to learn about the natural world around them. Download the free pdf printable scavenger hunt by clicking on the image below (all images are open source from Pixabay). Each one of these items has a section in the book for further explanation. After reading the section on the night sky about the moon, constellations, and shooting stars my oldest, Miss M (5 3/4 years old) wanted to make a constellation craft so we decided to try using scratch art to do it. Cardstock (white or light coloured). Yellow crayon or oil pastel. Black paint (we used craft acrylic). Paint brush, sponge, or sponge brush. Something for scratching - we tried out unsharpened (and sharpened) pencils, craft popsicle sticks, Q-tips and toothpicks. Toothpicks were the favourite here. We used some masking tape on the back of the cardstock to attach it to a larger piece of scrap paper as you'll be painting right to the edges. The tape keeps it stabilized during colouring and painting as well. Colour the cardstock in with the yellow crayon. Make sure no white space is left. The thicker the colouring, the brighter it will be. This is where we found oil pastels made the job a little easier. Once it's completely yellow, start painting the black on top of it and cover all of that yellow (this took a bit of convincing to Miss M that we weren't ruining her hard colouring work and that the end result would be worth it). I always used to wait until it was dry to start scratching (and you can do that with this) but she couldn't wait and wanted to start creating her design right away so I let her scratch in the wet paint and it worked just as well, if not better! When it's dry, it's a bit more work (and makes more mess) trying to scratch. When it's wet, it easily reveals the background with little work. I opened the constellation page and she scratched in little constellations to try to replicate the ones in the book, and then made up some of her own ones too! She got such a kick out of seeing the background appear and how it looked like a real night sky. I think once this is prepped (with dry paint), this would be a fun craft to take on a camping trip to allow little ones to scratch their own night sky art under the real stars. Thanks for joining us! If you haven't read our other book club posts yet, be sure to check out Atlantic Animal ABC (part 1 and part 2), Let's Read, The Snow Knows, Abigail's Wish, and A Harbour Seal in Halifax. Our next book will be announced in a few weeks on Facebook! Do you like exploring at night time with your little ones? What's the most interesting thing you've come across in your adventures?